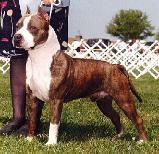 PTCH Harriet Tipit Z Hanky Needs breed book and registration number. No one has written a comment about J.Ch. Uruguay Karballido Staffs Zepelin Antruejo.